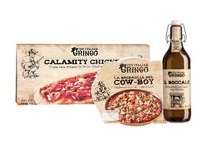 The Italian division of German retail firm Lidl is launching a limited edition of over 40 products that are inspired by the Western movie genre. According to a report in Foodweb.it, the discount retailer has worked with Italian suppliers to offer a selection of products under the name The Italian Gringo that combine quality and convenience. Packaging and branding are said to recall the Western genre through eye-catching design, flavours and product names. The range includes products such as Calamity Chicken (a stone baked pizza with chicken topping, onion and tomato), La Brodaglia Dello Sceriffo (a soup with barley, spelt and bacon), and Le Stelle Dello Sceriffo (Sheriff’s Badge – small cheeses in a star shape). Lidl’s The Italian Gringo range features over 40 items including food, drink and household products and will be available from the 9th of March.